Following on from my article on refining the front snap kick, here are some more kicking tips, this time in relation to the side thrust kick. 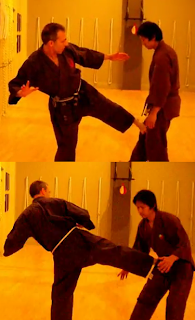 The side thrust kick is possibly the second most useful kick in the civilian defence arsenal after the front kick (many people think it is the roundhouse kick, but I disagree - more on that another time). And apart from any usefulness inherent in the side thrust kick, I think there's another, far more important, reason to learn and practice it: it's heaps of fun! And done properly it can look pretty cool. Just take a look at the adjacent picture of Bruce Lee and tell me it isn't cool! I spent many an afternoon as a teenager trying to get that signature side thrust kick position just right. But, try as I might, I simply couldn't come close to mastering the hardest part - holding your leg in place! I wanted to able to do what Bruce Lee did in "Enter the Dragon". Remember when O'Hara comes to Bruce's room while he is training? Bruce spins around with kicking leg in place, and says "Outside!" Classic stuff. First, slow side thrust kicks will develop your stabilising and supporting muscles. This will enable you to have greater stability, accuracy, efficiency and efficacy in your kicks when they are performed at combat speed. 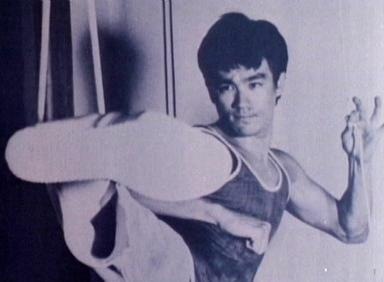 Bruce Lee certainly demonstrated how effective his side kicks were - see the video below. Bruce Lee's famous side thrust kick; some likened it to being hit by a car. Pound for pound, I don't think anyone has ever done it better. And it's not for want of trying; over the last few decades martial artists and fighters of all persuasions have kicked the blazes out of bags and shields trying (often in vain) to produce the same force exerted by this relatively small and light man. What are they missing? In my view, they are missing Bruce's core stablilising muscle strength. They can do fast kicks, but not slow ones. Another side kick from Bruce can be seen in this fight with O'Hara (Bob Wall) from the movie "Enter the Dragon". Wall insisted he take the kick for the sake of the shot. He ended up with multiple rib fractures and breaks and other reasonably significant abdominal injuries. In addition, two of the extras who fell behind him suffered broken arms. 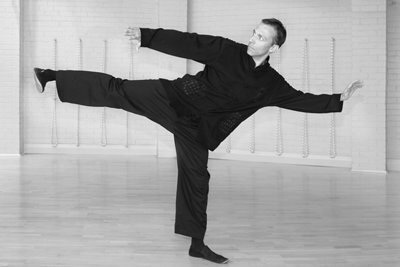 Second, side kicks are principally useful as thrusts - techniques aimed at pushing through and breaking joints. Accordingly, by their very nature, the side thrust kick is going to involve a longer "hold" than a snap kick. If your support muscles are too weak to keep your leg up, you probably won't be able to do an effective side kick anyway (at least, not for a mid to high level one - more on height of kicks in a minute). Third, there is more to traditional martial arts practice than learning to fight: having strong supporting and other core muscles is very good for your health and well-being. A good, slow side kick is a form of dynamic stretching and core muscle training. 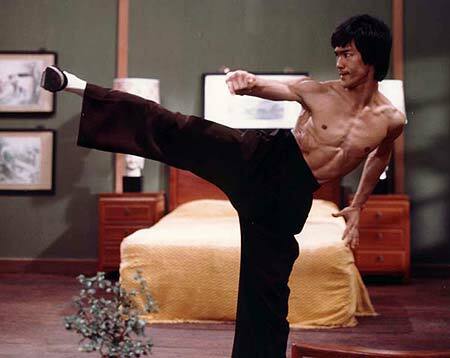 Accordingly, I still look to old Bruce Lee as the "beau-ideal" of side kicks. To me, his form is something I still strive to emulate. As I said earlier, I spent many an afternoon trying in vain to develop a modicum of the stabilising muscle strength Bruce Lee had in his side thrust kicks. I tried a number of approaches: static stretching on the ground, leg swings, tying a string from the ceiling and suspending my foot in it, putting my foot on a partner's shoulder or up on a shelf and, finally, just plain old kicking (and trying to increase my height, and the duration I could hold it at that height, from day to day). Which of these methods worked? In truth, only the last one. Because, as I've discovered, the only way to develop good side kicks is to practice them - slowly (fast is necessary too - but slow kick practice should come first!). One of the keys to developing good side kicks is to start out, at least initially (I like to do it as I warm up) using a support - ie. a wall, bar or other structure. This helps you isolate the muscles used in extending, stabilsing and holding the kick. The muscles that balance your whole body on one leg can complicate things, especially when you are not yet warm. Once you've warmed up, feel free to move away from the wall. In fact, you must do so. If you always kick using a support, you will invariably lean away from the kick. So when it comes to kicking shields, bags and opponents, you might well find yourself pushed off balance. But initially, support is good; in fact it is an essential part of developing the right muscle strength and memory. If you spend most of your training time hopping around and falling over trying to balance, you'll never get your kick right. The next important thing to notice is the chamber of your kick. When you execute a basic side thrust, the chamber is identical to that of a front kick. I can't emphasize this enough. If you lift your leg hinting at a side thrust, you will find yourself being evaded. That is because side thrust kicks take a longer time to position than a front snap kick. Any "tell" is easily exploited. And I'm not just talking from theory here: I have experienced this personally. By contrast if your front kick is chambered correctly - ie. 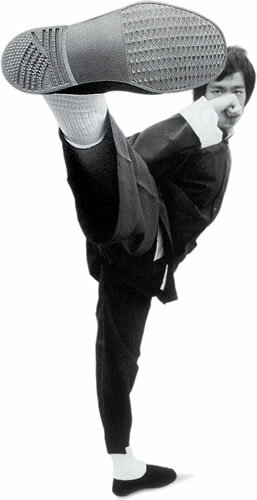 with the sole of your foot parallel to the ground, knee cocked and pointed straight forward - your opponent will assume you are about to do a front kick. He/she will also subconsciously know that you are out of range for that kick (a front kick is an appreciably shorter-range kick than a side kick). Accordingly, your opponent won't necessarily react to the movement, perceiving it to be of little threat. When you abruptly change it to a side thrust kick, your opponent might just get a bit of a nasty surprise. But chamber your side kick with your intention telegraphed, and you won't enjoy this same element of surprise. The next step is the extension from the chamber. The most important point to observe here is to avoid dipping the knee as you do so. I find the most useful tip in this regard is to try to keep the sole of your foot parallel to the floor for as long as possible. Of course, this won't be possible for very long when you're doing a high kick, but it is eminently possible with low kicks (eg. to the knee). However even with high kicks, an emphasis on keeping the foot "as parallel to the floor as possible" has the consequence of keeping your knee higher than your ankle. And dipping your knee to the same height as your ankle (or worse, lower than your ankle) should be avoided at all costs. I call the "knee dip" the "piston kick". If you do a piston kick, you rob yourself of a substantial portion of the force gained from the staged activation of your hip; all you have left is the outward extension of the leg itself. The final rotation of the hip (which is what happens when your knee drops) has already occurred. What I'm about to say next should be obvious: the last thing to happen as you complete the extension of your leg is that your hip should be thrown into the movement. This throws the full force of your body into the kick: you're not just relying on the momentum of your leg extension. The hip is thrown into the kick just before your extension is complete. Depending on your orientation at the time of the kick, you might want to pivot a bit on the ball of your supporting foot. This is because side thrust kicks are not executed with your supporting foot side-on to your opponent. Nor should be perpendicular to your opponent, since this would (in most cases) anatomically invite you to convert to a back kick. Instead, your foot should pivot so that it is approximately 45 degrees to the rear. Note that the pivot must occur on the ball of your foot and not the heel: the ball of foot pivot ensures that your bodyweight pivots into the attack. By contrast, if you pivot on the heel, your bodyweight will remain stationary, leaving you with an insipid outward extension of your leg as the sole source of your force generation. And pivoting on the heel as you do a complex, highly mobile and balance-oriented technique like a side thrust kick would be foolhardy indeed. I discuss pivoting on the ball of the foot or the heel. In the case of the side thrust, you pivot on the ball of the foot as this will drive you forward into the target, where pivoting on the heel will keep you on the same spot while simultaneously making you unstable. The net effect of the hip movement will be to throw your body into a straight line. What do I mean by this? There should be a straight line running from the contact point on the edge of your foot, through your hip and into your body. Only when your body aligns in this straight fashion can you be assured of having a strong enough foundation for the considerable force that will be transmitted back into your body as you impact. While Bruce Lee might have posed for many shots so that his body appeared to lean out to one side, this was almost certainly as a result of either the camera angle or a pose adopted strictly for photography reasons. After all, people wanted to see Bruce Lee's face - not just his foot! In the end, strong side kicks require your upper body and leg to line up. In the above paragraph I mention the need to line up the contact point with the rest of your body. But what is that contact point? Most martial artists would correctly identify it as the edge of the foot (rather than, for example, the sole). What becomes a bit more nebulous with some folks is exactly where on the side of the foot. If pressed, some would venture the middle of the foot. But they'd be wrong. In fact the correct contact point is the edge of the foot from the edge of the heel to a point 3-4 inches along. It is important to note that in order to present this contact point correctly, you need to ensure that your ankle is optimally oriented. For one thing, your heel should be just a tad higher than your toes at the completion of the technique. Bruce Lee's foot was often just flat from heel to toe, but I suggest to you that he could get away with it! For you and me, it is better to avoid putting the toes in prominence and the little slope down from heel to toes helps this (or rather, helps put the right contact surface into prominence). The best of us have done this overturn at some point in our careers. For example, take a look at the adjacent image of Bruce Lee doing a side kick and you'll see that, in sharp contrast to the photo at the start of this article, his ankle is clearly overturned. The consequences of contacting with such an overturned ankle are not worth contemplating. I remember back in around 1985 my brother jokingly decided to do some board breaking at an end of year dojo barbecue. The wood that was selected was pine - but not of the breaking kind (the grain went the wrong way). Nonetheless he was reasonably confident of breaking it given its length and brittleness. So he leaned it against a tree at an appropriate angle and gave it an almighty stomp. The problem was however that he had accidentally overturned his ankle in the manner Bruce Lee demonstrates here. The result was a rolled ankle and a fairly nasty sprain. I can only hazard a guess that Bruce had this photo taken before he'd learned a similar lesson. One can get carried away by theory and aesthetics - however realistic impact will always be a great leveler. The last thing to note is that your toes should all be pulled back. They need to be well out of harm's way. Perhaps the oddest "fad" in side thrust kicks occurred at some point in the late 60s and early 70s when certain karate schools started to teach the "big toe up, little toes down" side thrust kick. This was thought to better accentuate the ankle shape. Of course it did two things: it encouraged overturning of the ankle and it ludicrously exposed your small toes to contact, and therefore damage. While I recall some "survivors" of this fad, you'd be hard-pressed to find anyone today who will admit to this experimentation. I said previously that side thrust kicks are intended to push through your opponent. The most common application of this is as a joint break. What joints are you likely to be breaking? Quite obviously the lower ones, specifically the knee and the hip. This means that your side thrust kick will be employed in a stomping action, taking full advantage of gravity to generate as much force as possible. Clearly the kick can also be used to strike the abdomen generally in the manner demonstrated by Bruce Lee in the video at the start of this article. Or the kick can even be employed to the face. But would I recommend this? No. My first teacher, Bob Davies, always used to say: "You would no more kick to the face than punch to the foot." I always took him to referring here most particularly to the side thrust kick. It is eminently suited to the task of low attacks - and spectacularly unsuited to high ones. That Bruce Lee and others make a high side thrust look good is beside the point; it doesn't mean that it would be their natural weapon. Note my use of the side thrust kick in the context of the opening shin deflection (ashibo kake uke). In this case the kick attacks the inside of the thigh, but the angle of attack can damage both the knee and hip of your opponent's supporting leg. If you must kick high, then I would strongly suggest doing so with a snapping kick - eg. a front kick or a snapping roundhouse - since these are fast kicks and you need to minimise the time you spend with one foot high in the air. Either that or you could use a follow through kick (eg. crescent kick or instep roundhouse), in which case the time spent in a high position is transient anyway. By contrast the side thrust kick requires you to spend an excessive (in my view) time "pushing" through at one level. And if that level happens to be high, you are spending far too much time in a balance/mobility-compromised position. So why practice high side thrust kicks? The answer is simple: to develop greater skill and flexibility. If you can do a very good high side thrust, you will find low kicks that much easier. And you should be striving to improve your general flexibility and core/stabilizing muscles anyway; high kicks enable you to do so. It is important to note that this doesn't mean everyone should expect to kick as high or as elegantly as Bruce Lee. I've spend 30 years trying to do so and haven't come close. You practice to kick as well as you can, knowing full well that it is an exercise - not a technique or tactic you will employ. Martial training is not a competition where you judge yourself by the gymnastic or other ability of others. It is an art where your only competition is yourself. The front snap kick might be the "king of kicks" when it comes to practicality in traditional fighting systems. But to my mind the side thrust kick is the "king of cool". Close your eyes and imagine a picture of Bruce Lee, and chances are you'll see him doing a classical side thrust kick (to the face!). I've spent more than 3 decades trying to get this technique right. I haven't gotten close to dear old Bruce in terms of ability. What have I achieved? A pretty decent core/stabilising strength in my legs that has served me well - particularly in low kicking and even in the odd high kick. I attribute my continuing ability to kick (despite some rather painful arthritis in my lower back resulting from non-martial arts causes) to years upon years of slow, careful side kick practice. Done correctly it can stabilise and strengthen your back, hips and even your knees. Done poorly it can damage all of these. So I think it is worth your time learning how to do a proper side thrust kick - if not to develop some fairly fundamental muscle control and kinaesthetics for use in practical techniques, then so as to be "lookin' good!" (to quote another "Enter the Dragon" character, Williams - played by Jim Kelly). No one said martial arts always had to be bone dry and function driven! So here's my tip for martial arts New Year's Resolution: practice slow side kicks and start looking cool like Bruce Lee. Enjoy! I 'm glad Narda! Thanks! This series takes me back to my basic training where we had to do all the basic kicks (front, back, side and the seisan low kick and crossing the leg) in sequence while standing on one leg. Remember? A very powerful and useful defense.Very good article indeed! A thoroughly refreshing article on something so simple it's practically never been explained. I have a large craving to be as cool as you are and hold my leg out for hours every day! I'm a little unsure what you mean by "overturning the ankle"- do you mean pointing the toes too far down and raising the heel too high? Or possibly extending the blade of the foot rather than pulling the toes back? "Note that the pivot must occur on the ball of your foot and not the heel: this latter element ensures that your bodyweight pivots into the attack." Did you mean the former element rather than the latter? Additionally, looking at the pictures of Bruce, his heel and toes seem to be on the same line rather than heel-raised-toes-down. As the pinnacle of side kickers, why do we defer from his "flat-footed" style? Lastly (I store all these questions in my head for so long they all come tumbling out as soon as I start asking them) I'm having some trouble not locking my knee for thrust kicks like this one. Do you have any advice? Ah yes Jorge - the multiple basic kicks do bring back memories. Note to self: must drag them out for the current students! Thanks Xin! Some good questions there. By "overturning" I mean rotating the "blade" of the foot down too much - in other words, bringing your sole so that it is approaching parallel to the floor. This overturn rolls your ankle when you impact. ""Note that the pivot must occur on the ball of your foot and not the heel: this latter element ensures that your bodyweight pivots into the attack." Did you mean the former element rather than the latter?" I mean that pivoting on the ball of the foot ensures you pivot into the attack. I'll fix the paragraph. "Additionally, looking at the pictures of Bruce, his heel and toes seem to be on the same line rather than heel-raised-toes-down. As the pinnacle of side kickers, why do we defer from his "flat-footed" style?" Bruce's foot was indeed often straight, but he managed to impact properly despite this idiosyncracy. For the rest of us, I'd advise a slight angle downwards from the heel! "I'm having some trouble not locking my knee for thrust kicks like this one. Do you have any advice?" It is indeed hard to engage the right support muscles to prevent lockout with a side thrust. My advice is, don't do it as a hard "air" kick. It is made for impact; do it hard against a shield. Otherwise you'll invariably risk hurting your knee. Love the post Mr. Djuedjevic. I never thought so much about the placement of my feet. I simply followed the instructions of my Sensei, I now see that I am performing this in a potentially detrimental way. Thanks for saving my ankle. I wonder what your thoughts would be on weight/resistance training for this technique. Do you suggest it? If so what method; fast or slow? air or target? ankle weights, or bands? It's funny you know Patrick, but after my brother practically broke his ankle we both concluded that the side thrust is almost a heel kick. I say "almost" because it is still a stamp with the edge of the foot, it's just that the "knife edge" analogy is fundamentally flawed. Bruce Lee's "flat foot" version is preferable to his "knife edge" one: diffusing your force is always better than concentrating it incorrectly and hurting yourself. It's a good thing one can and does learn from mistakes. This process has similarly influenced my views on alignment of the forearm and fist in punching (see these articles). I've had too many sprains/injuries of wrists and knuckles to ignore the relevant lessons! As to weights and kicking, I used to have ankle weights (I still do somewhere) and I tried them for a while. With good, careful form I suspect they can't do anything but help, but I never gave them enough of a go to say for certain. I will say this: don't do leg swings, with or without weights. They don't really help anything except swing type kicks (axe kicks, crescent kicks being 2 examples). They won't do diddly squat for the side thrust and can actually hurt your hips (a condition known as "dancer's hip" which I suffered as a younger black belt until my lower limb specialist told me to kill ballistic leg swings and replace them with slow chambered kicks. In the end, I think that if you can't hold your leg out by itself, you don't really need to look at weights for a while. If you're managing to hold your leg out for a while, then mixing it up with some ankle weights is probably a good idea. Confusing the muscles is just one benefit - they tend to develop faster under such conditions. Great article, my love of the side thrust kick has been rekindled! It would be fantastic Dan, if you could give similar treatment to the side snap kick,aka keage in shotokan circles. It occurs a lot in the shotokan kata, so I assume it to be important, but I struggle to appreciate its practical application compared with the side thrust kick. I keep a list of article ideas in my smartphone - and one that's been there for quite a while is yoko keage geri. Definitely an interesting topic! I hope to cover it in the new year. I think that is a good point you mentioned regarding weight training. I will try to apply these principles for my new training for knockdown fighting, as I mentioned in my blog. Very cool article, I love how every part of the body is explained in rigorous detail, at every point in the kick. I don't know if you care, but I just wanted to point out that you used the phrase "Begs the question" wrong twice in this article. I do care! I've used the expression for years mistakenly assuming it to mean "raises the question" rather than "assumes a conclusion", so thanks for that. You learn something new every day! Oh, I've been using the word "wrong" incorrectly for years also! Thanks back! Now THIS is a great article on the side kick. I'm going to reread it when I get home and try out some of the suggestions. Odd thing is that in my Kyokushin school WE do the 'foot over rotated' thing with our side kicks. And Kyokushin is particularly known for its practical approach to kicking technique. Looks like I've gotta talk to my instructor about this. Brett, I can pretty much guarantee that however you do it in the air in kykokushinkai, against a bag or shield your ankle isn't over-rotated. A lot of men have poor flexibility - even in the ankles - so telling someone to rotate the ankle "as much as possible" doesn't necessarily mean over-rotating! It's a little detail that often goes unnoticed.